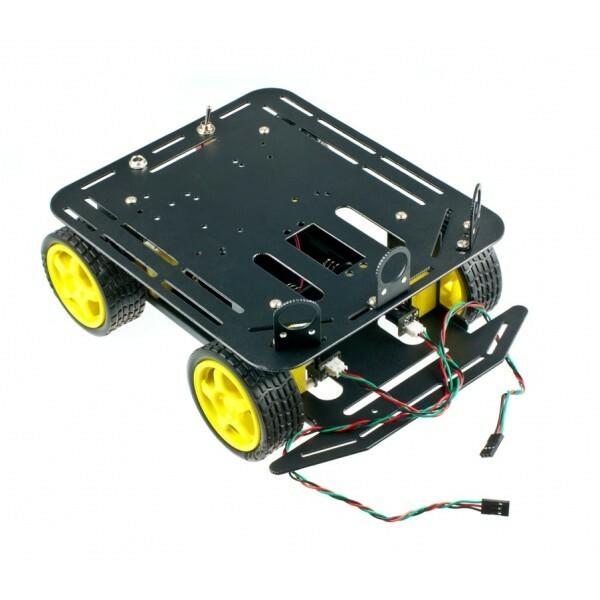 The DFRobot 4WD Arduino-Compatible Platform w/Encoders is widely used on the world's self-developed control panel platform. This drive method has a strong obstacle and climbing ability with high strength aluminum alloy body. It features thick acrylic material to eliminate the heavy, fragile thin acrylic material defects. The powerful motor performance, flexible and rapid movement is especially suitable for outdoor grass, gravel, sand, or slope pavement. It is very useful for robot competitions and other research projects. It's car mounting holes is compatible with a variety of sensors. There is enough space within the car to install the battery. It is made with the consideration to facilitate the future expansion of PTZ cameras or more degrees of freedom manipulator. This platform comes with two sets of encoder can be precise control of the car trip, and the closed-loop PID control.